Noise is a random variation of image density, visible as grain in film and pixel level variations in digital images. It arises from the effects of basic physics— the photon nature of light and the thermal energy of heat— inside image sensors and amplifiers. Noise and its measurement are introduced in Noise in photographic images. Noise is measured by several Imatest modules. Stepchart, Multicharts, and Multitest produce the most detailed results, but noise is also measured in Colorcheck, SFR,SFRplus, eSFR ISO, and Uniformity. ISO 15739 Visual Noise estimates the visual strength of noise using the noise spectrum, a model of the human visual system, and viewing conditions. Noise scales strongly with pixel size. It can be very low in digital SLRs, which have pixels at least 4 microns square. But it can get ugly in compact digital cameras and camera phones with tiny sensors, especially at high ISO speeds or in dim light. It is also affected by sensor technology and manufacturing quality. 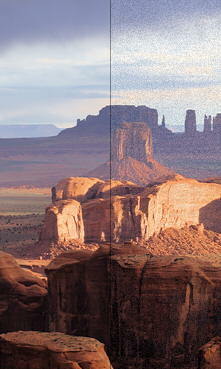 Software noise reduction (NR) reduces the visibility of noise by smoothing the image, excluding areas near contrasty boundaries. This technique works well, but it can obscure fine, low contrast detail. The Log Frequency-Contrast module clearly measures the effects of software noise reduction. The Random/Dead Leaves module uses a pattern that tends to maximize noise reduction (it’s the worst-case for noise reduction)— in contrast to the slanted-edge (the opposite limiting case), which tends to maximize sharpening and minimize noise reduction.